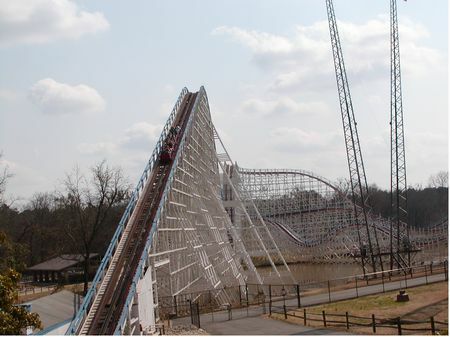 The Great American Scream Machine is a roller coaster in Lickskillet at Six Flags Over Georgia. While it's not the best, it is also recommended. The minimum height to ride is 42 inches. This circa 1973 wooden coaster features 3450' of track, a 90' first drop, a top speed of 57 mph, and a ride duration of two minutes. It was built by Philadelphia Toboggan Coasters, Inc.